Not everyone looks good in green, but Miley Cyrus manages to pull it off in this billboard in her own inimitable style for this year's MTV Music Video Awards. Two years ago the pop singer made a distinct impression performing at the awards twerking away with Robin Thicke and a foam finger, so who knows what to expect now that the former Disney child star will be hosting the awards ceremony this year. This award-lickin' good billboard, which you can't help but notice, was snapped along the Sunset Strip in West Hollywood on August 7, 2015. If you like this year's ad creative, be sure to also check out the 2014 MTV Video Music Awards billboards featuring Beyoncé and Usher. For other cool music awards billboards you should also check out this glittering lips billboard for the American Music Awards and these Grammys billboards. 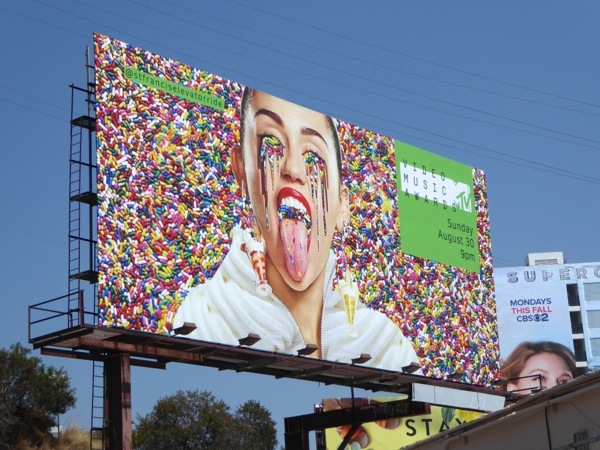 Plus if you're a fan of the pop star, be sure to check out this other Miley Cyrus billboard from last year. Remember to join the party on August 30, 2015 (licking of awards not mandatory), and expect the unexpected. UPDATED: Daily Billboard also spied this giant-sized wall mural for the awards show in the heart of Hollywood on August 16, 2015. 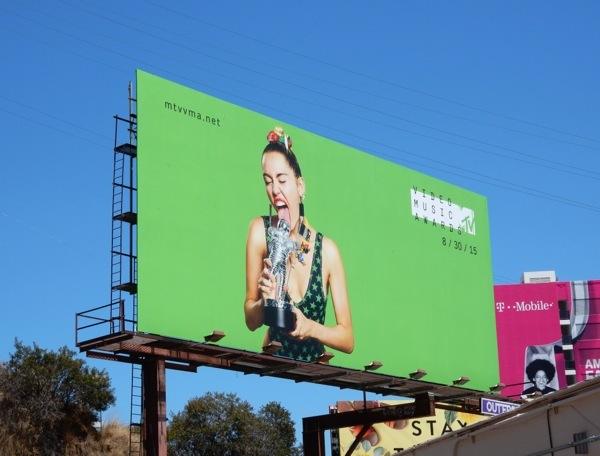 This super-sized wallscape with Miley licking the VMA 'Moonman' award is even more in-your-face and you truly can't miss this vivid lime green billboard. UPDATED: If the first billboard creative wasn't enough to convince you that Miley Cyrus will be bringing the crazy to the MTV Video Music Awards this year, then maybe this followup ad creative will give you a hundred and thousand reasons to tune in. This extremely trippy MTV billboard was snapped along the busy Sunset Strip on August 20, 2015.